Tofu kebabs are a great addition to any meal and so yummy. They are filled with nutritious vegetables and protein-rich tofu. A great vegetarian addition to a barbecue this summer too especially for those wanting a vegan option. Place finished kebabs in a large, flat plastic ceramic or glass container. Cover with Olive oil and balsamic vinegar. Marinate 4 hours or overnight. Pour off extra marinade. Since there is no meat in this recipe, the extra marinade is safe to be reused as a salad dressing. Grill kebabs on the barbecue or broil in the oven, about 5 minutes per side.Makes 6 large kebabs. 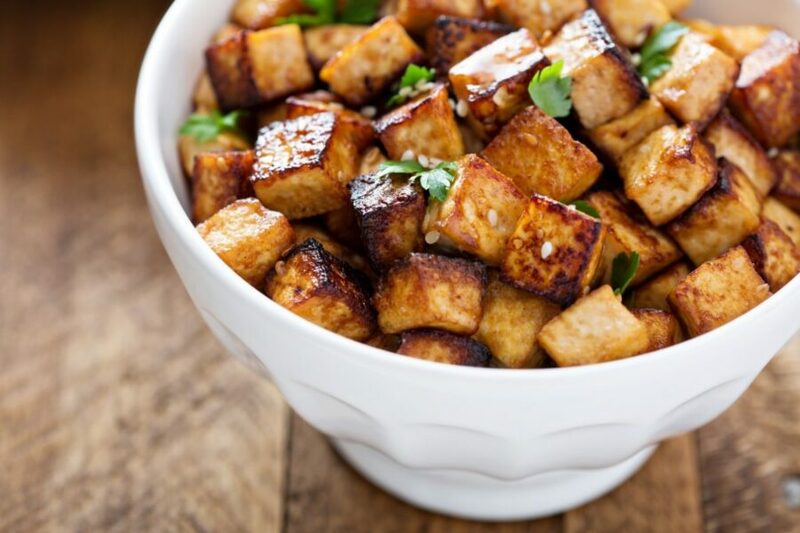 Crispy Tasty Tofu is a Great Addition to Meals – I enjoy adding crispy tasty tofu to a meal. It adds a vegan protein which is actually good for us. Marinated Tofu – If you like tofu, or would LIKE to like tofu, this marinated tofu recipe is fast and delicious.